Avoid these SEO errors in your eCommerce site for optimizing the store performance. Websites around the world are thriving due to their effective presence on various search engine result pages (SERPs). In an online business, the future of a website depends on how well it is promoted and recognized by people in search results. With the gradual increase in the coverage area of the internet along with the emergence of new SEO techniques and algorithms, the impact of SEO has become much stronger than before. We all have heard about how numerous websites are being penalized by Google due to its intelligent algorithms like Google Panda, Google Penguin, Google Humming Bird, Google Penguin 4.0 (Real time) and others clearly explain that the search engines are getting smarter day by day. With such a drastic change in the working of search engines, a small SEO mistake can invite harsh penalties and can cause severe loss to online visibility. Take a look at some of these critical SEO errors that need to be avoided by eCommerce SEO company for optimizing the performance of an online store. Product description informs the customer about a product and helps in making the right purchasing decision. - Use a high-quality product image with your product description. - Don’t use copied content for your product description. Keep it unique and authentic in nature. - Use only a crisp and relevant product description that can engage customers towards your online store. Encourage product reviews by customers on your site to increase product sales and conversions. Customers nowadays have become much more vigilant than before while making an online product purchase. They make a detailed research about a product before finally making a product purchase and product reviews are one such attempt in that direction. If you want to understand the impact of reviews on conversion rates, you need to check out this graphical report by Bazaarvoice. 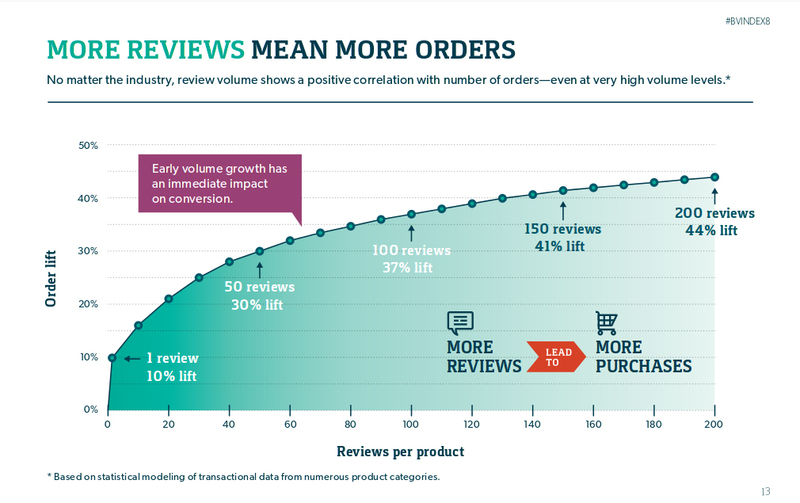 Understand the impact of product reviews on the conversion rates of your eCommerce site. - They help in building better customer engagement for optimizing the sales and performance of a store. - It improves the visitor count on a product page that affects the overall visibility of your site on search engine result pages (SERPs). - It encourages the customer to purchase a particular product by increasing their trust and interest on an online store. Consider improving the metadata of your eCommerce site for optimizing the store performance. Search engines are at a war with duplicate and non-authentic content and tend to penalize the sites that do not follow this rule. This duplicate rule is not only applicable for site content but is equally true for page titles and meta data. Often, eCommerce sites are facing severe issues while creating unique title tags while selling multiple items of a particular type or brand. This exercise involves the use of repetitive keywords which causes unnecessary keyword stuffing that is not considered good by search engine crawlers. In fact, crawlers are expert at locating the metadata such as page titles, descriptions, keywords and other such related content that consists of duplicate information. To stop crawlers in indexing your duplicate content to avoid search engine penalties, it is important to use meta tags such as robots noindex that can guide search engine not to index a particular page consisting of duplicate content. The generation of duplicate content in eCommerce occurs while writing the product description and other information of a product with a different color, size, and varieties or while applying A/B testing on a site. To handle this situation, it is important to hire a reputed eCommerce SEO company that knows how to make use of canonical URL tags, no index tags, robot.txt file, nofollow attributes and other such mechanisms to handle the duplicate content on an eCommerce site. Handle the redirects carefully to avoid penalties by search engine crawlers. There are several instances in an eCommerce site where user come across a message saying “Error 404: page not found” while opening a product or category page. It comes as a common phenomenon but it can have a significant impact on the overall search engine rankings of a website. One Google report about redirects says that “every 301 redirect loses about 15 percent of the link authority which it is about to transfer on a receiving page”. When crawlers come across these pages while indexing an eCommerce site, they took it as a sign of improper site management and tends to penalize the site. In order to resolve this issue, eCommerce SEO services company can take the help of various web analysis tools that can offer clear information about 404 error pages for ensuring effective resolution of these error pages for improved SEO rankings of a website. - They need to take required action to change 302 redirects on a site to 301 redirects. - It is important to keep a track on the redirect activities to understand the number of attempts that are required to land on the right page. Keep on tracking till you get the 200 OK page for your site that informs you about landing on the right page of your site. - Minimize the number of redirect attempts on a site by improving the internal link structure for better online rankings. Non-optimized product pages- Product pages are the main element of an eCommerce site that helps in grabbing the instant attention and conversions of a website. Visitors that search a product on a site often uses a keyword or phrase that lands to a particular product page or category page. To ensure that your targeted customers are landing on the right page for the first time, it is important to consider the popular keyword or phrases while designing the headlines, title pages, product descriptions and product pages for a website. For improving the visibility of your product pages, you need to promote the product pages based on the popular keywords, search terms and phrases used by people on an eCommerce site. Ensure that your title tag, H1 heading, image alt tag and other such information is properly optimized for the improved online rankings of your eCommerce site. If you feel that your product pages are not performing at the expected level, you need to try out the following tips as suggested by eCommerce SEO company of Velocity. Don’t forget to use model numbers in the title tags and H1 headings of your eCommerce site. Make use of brand names in the title tags and H1 headings. Don’t forget about filling the image alt tag information. Make judicious use of the keyword terms and phrases in the product page content. Don’t use iframes for displaying content. It is important to ensure that the product page actually exists. Don’t ignore every other SEO error on your website as these small mistakes can prove to be fatal for your eCommerce website. So, take required steps to tackle these SEO errors for optimizing the performance of an online store. Remember that the key to improvisation is to “Make hay while the sun shines”, so don’t wait for the problem to aggravate further and perform the remedial measures in time.